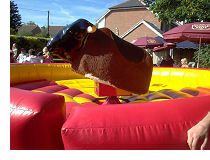 Rodeo Bull, Bouncy Castle, Marquee and Tent Hire, Casino Nights, Disco, Garden Games, Wild West in Herefordshire, Worcestershire and other areas. Rodeo Wrecks, based in Hereford and Worcestershire, your first choice for rodeo bull, bouncy castle, marquee and tent hire, casino evenings, Boogie Nites disco, garden games, arcade machine hire, motor racing simulators hire, inflatable games, games hire, wild west themed events and much more. The Rodeo Bull, or Bucking Bronco, has become one of the elite must-haves at many parties, balls, promotional events and company fun days. A Rodeo Bull combines the perfect high-energy competitive atmosphere with pure fun and laughter - providing equally as much entertainment for the spectators as it does for the riders! 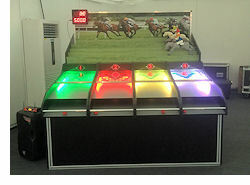 Our brand new 2006 model competition-level Rodeo Bull can give all participants an identical ride, at three different levels. Alternatively, the Rodeo Bull can be manually controlled at slower speeds for the younger rider, or faster speeds for the professional rider! Our new 'ride on' sheep has an authentic fur textured body. You'll have heard of the Rodeo Bull simulator and you may have heard of the Bucking Reindeer but when it comes to farmyard ferocity you ain't seen nothing till you've been savaged by a bucking sheep! 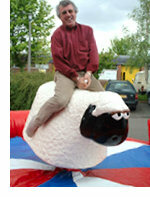 This cuddly sheep might look friendly but once you're astride it has a mind of its own! It starts bucking and spinning till it launches you to the surrounding inflatable bed. This is a wacky ride that really takes some beating. Available for both indoor and outdoor events. Our Baby Rodeo Bull is the newest addition to our Rodeo Bull family. 'Billy Bronco' has been specifically designed for the little ones that are just that little bit to small to ride the full size Rodeo Bull. The Baby Rodeo Bull is the perfect addition to your little ones special day - as a treat or a perfect accompaniment to our full size Rodeo Bull. It keeps the little ones busy whilst the big kids are playing on that. 'Billy Bronco' is much more tame that the full size rodeo bull, only having the buck movement and not the spin motion, making sure the children have no chance of getting hit by the bull. He is manually operated by our fully trained staff to make sure that each ride is tailored to the rider's ability. The Baby Rodeo Bull is controlled the same as the adults rodeo bull; we can slow it down or speed it up dependant on the child’s ability, creating long-lasting memories and hours of laughter. Who says the adults should have all the fun? Everyone remembers the seaside donkey derby game, where players roll their balls down the chutes, attempting to score points as the ball drops down the marked holes. The more points they score the faster their donkey moves. 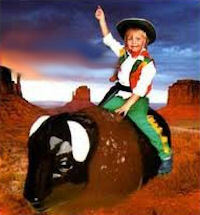 Rodeo Wrecks is a family business, owner-operated, and provides the ultimate friendly service. 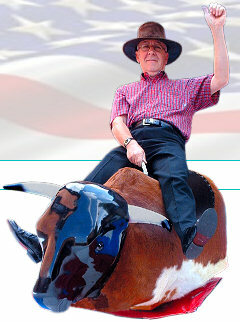 Experienced and fully trained operators come with each Rodeo Bull hire period. We cover: Hereford, Worcester, Herefordshire, Worcestershire, West Midlands, Birmingham, Bromsgrove, Redditch, Kidderminster, Sandwell, Dudley, West Bromwich, Warwickshire, Gloucestershire, Cheltenham, Evesham, Gloucester, Wales, Shrewsbury, Bridgnorth and many more areas.